After their sequestering on reservations across the West, American Indians suffered from appalling rates of disease and morbidity. While the United States Indian Service (Bureau of Indian Affairs) provided some services prior to 1908, it was not until then that the Indian Medical Service was established for the purpose of providing services to American Indians. Born in an era of assimilation and myths of vanishing Indians, the Indian Medical Service provided emergency and curative care with little forethought of preventive medicine. DeJong argues that the U.S. Congress provided little more than basic, curative treatment, and that this Congressional parsimony is reflected in the services (or lack thereof) provided by the Indian Medical Service. DeJong considers the mediocre results of the Indian Medical Service from a cultural perspective. He argues that, rather than considering a social conservation model of medicine, the Indian Service focused on curative medicine from a strictly Western perspective. This failure to appreciate the unique American Indian cultural norms and values associated with health and well-being led to a resistance from American Indians which seemingly justified parsimonious Congressional appropriations and initiated a cycle of benign neglect. 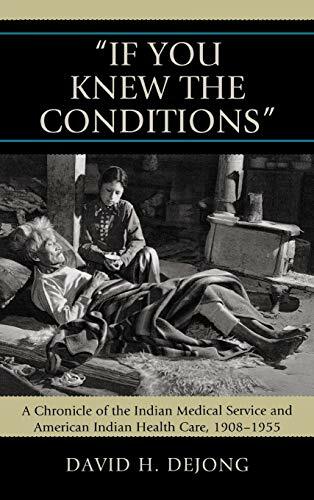 "If You Knew the Conditions" examines the impact of the long-standing Congressional mandate of cultural assimilation, combined with the Congressional desire to abolish the Indian Service, on the degree and extent of disease in Indian Country. David H. Dejong holds a PhD from the University of Arizona and has worked in Indian country for 18 years and is author ofPlagues, Politics, and Policy: A Chronicle of the Indian Health Service, 1955-2008.